Who Could Have Slipped Through the Cracks? It is always good to contemplate who could haves slipped through the cracks in the records that have been located and used. Henry and Barbara Trautvetter’s known children were named in a 1870-era estate settlement for Henry’s brother in Hancock County, Illinois. The brother had no children and Henry was one of his heirs under Illinois state statute. While Henry survived his brother, Henry died before the brother’s estate was finally settled. Henry’s death necessitated that his children be listed in the probate record as they became heirs of Henry’s brother upon Henry’s death. Henry’s children who survived him. Henry’s pre-deceased children who had descendants of their own alive at the time Henry’s brother’s estate was settled. Children who died before Henry and did not leave descendants of their own would not have been mentioned. Think about the record you are using–who would be in it and who would not. 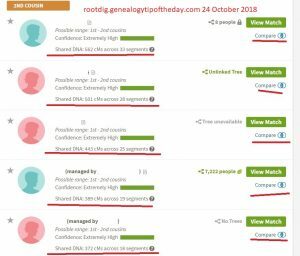 ← Is Membership in a DNA Circle at AncestryDNA Proof of a Relationship?